today’s adventure: strap ’em on! First day of skiing for the 2013-14 season is in the books. 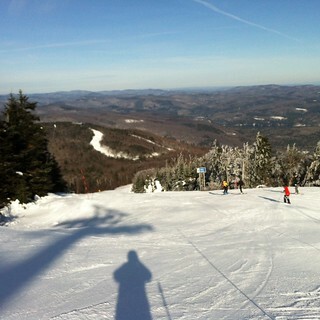 It was a great day to ski in Vermont: cold, dry, sunny, calm wind, and no crowds for the first two hours. I actually took 4 17 runs – a bug in the software, tho the other data is OK. This was my first time using Ski Tracks, a smartphone app that tracks ski data. It separates uphill data from the descents, which is really cool. It’s not without problems, though. When I paused the app for lunch, it lost count of my total runs – or at least reset the run count. I had 8 11 runs before lunch, 6 after. It did retain the rest of my data, though, so… a bug. My runs and lift rides at Okemo, in nifty map-track format! It was nice to get some time on skis before my coaching gig starts in two weeks.